Today, I acted as chauffeur for a couple who wanted to get the first iPhone 5S at the Apple store. 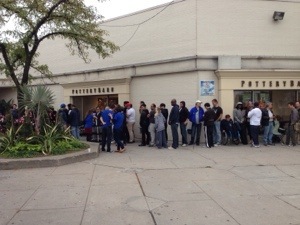 We arrived at 7 am and found about 150 people in line outside Sherway mall, in Toronto. Full disclosure: I own an iPhone 5. Love them, or not, one cannot deny that Apple has created a myth around their brand – based on great design, packaging, the user experience, etc. That myth is so strong within their tribe, that they will camp out for the newest Apple phone – overnight, if need be. Commercialism aside, isn’t it cool that this myth has such strong pull with these folks? How would our lives change, if we could find such a powerful myth for our own lives? It would pull us along our path – and into an awesome quest! This entry was posted in Myth and tagged Apple by edvanhooydonk. Bookmark the permalink.